The plan is to tour Britain in comfort. It is amazing how quickly the novelty of tents wears off. 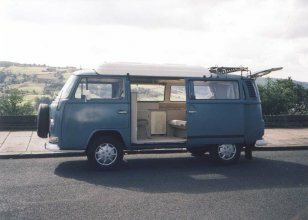 This wonderful vehicle sleeps 4 people and has its own kitchen and dining room. Bought from Norman, we are the second owners in this vehicle's 30 year life. 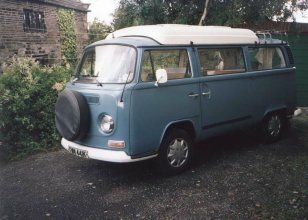 After a year or two of pondering about getting a bus, and buying a couple of VolksWorlds, I decided I had to have one  surfing and biking holidays are fun, and the Mini is always reliable. Being a fashion victim, I had to have a bus (at least I thought cooking and sleeping would be easier: its not just for style!). The end of the season 2002 seemed like the ideal time to buy, when prices fall for winter. Then, Practical Classics published their cover story in July 2002, well it was too much. The article is hilarious, such an old, slow, temperamental vehicle  I had to have one! David appeared to share the passion that was growing and burning daily. David is a petrol head  check out his Mini web pages. We decided on a Bay Window Bus  theyre bigger, go faster and stop better, the vehicle had to meet practical needs first and foremost. The plan: to go to the Tatton Park show, VW Northwest on 11th August 2002, look at pristine vans, chat to people and find out what to look for and definitely not buy one. We arent ignorant of vehicles, but the bus is a mystery, having little in common with the Mini we know and love. We werent going to buy a pristine, concours vehicle, a used but loved vehicle was required. The plan failed, although not entirely. We picked up an overview of what to look for, crawled under a view buses parked in the quagmire of the sales lot, and listened to a few air cooled motors. Then, we saw the Blue Bus. It had everything we needed, at a distance we could see the shell was straight, clean and free of the inanimate enemy: rust. Moving closer we saw a serviceable interior. Not a gorgeous, seductive suite, but solid and in good condition. Another roll in the mud revealed an underside Bus Boys dream of: no rust, solid metal and thick underseal like black icing on a cake. The vendor, Norman, turned out to be the vehicles only ever owner, the two had lived in symbiosis for 30 years to the obvious benefit of both. He showed us the body, the original Dormobile interior, with the fantastic side hinging raisable roof, complete with two bunks. After many hours thought, we decided that it had to be worth another look and arranged a test drive. That was not part of the plan, hardly reconnaisance! "Oh my, this is marvellous. Ho ho ho" he immediately exclaimed, letting the Poker Face slip. I was getting jealous and excited, wanting my turn with the controls. I released the handbrake and swung my hand at the familiar handbrake position near the left hip, realised it wasnt there and eased up the clutch, the bus moved! It was exhilarating, this lovely bus worked, properly, and it could be ours, I opened the throttle, and tried for second, which had been a problem with the other bus I had driven just a week previously. I couldnt find it, but that was just the big bus lever and little linkages, no trouble in the box as I stirred the porridge out of the way and slotted it into second. It went faster, about 15 miles per hour, but so what? Its a real bus, and it went round a corner too! A few hundred metres later I was at 30mph, in fourth, the bus was cruising, the motor was contented and I was delighted with it. That night was a time of soul searching, and counting. We knew we would have to pay more for this Bus than we had hoped, but we knew it was worth it. It matched all our criteria, that the body, accommodation and motor (preferably unleaded) were in good, serviceable condition. It had no stupid paint or alloys to push up the price, and of course, it wasnt lowered  a pointless exercise. Deciding: the Agony or the ecstasy? We found our souls, woke up the next morning and called Norman to negotiate a compromise price. Two days later, the Bus was on home ground, and we were much poorer, but happy! The bus has been used as a joyriding vehicle around Calderdale, for showing off and picnics! It already has friends in Luddenden Foot and Sowerby. September 1st saw the Bus debut at the Bradford and District VW club summer show and shine at Low Moor, Bradford. Pictures can be seen on the Volkswigan web site http://www.volkswigan.fotki.com/showsmeetings/bradford__district/dscf0059.html. 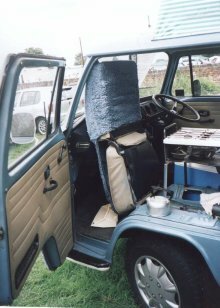 The highlight for the Blue Bus so far was Vanfest, organised by the Type II owners club at the Three Counties Showground, Malvern from the 13th  15th September. This show is Vantastic (please excuse the inevitable pun), well organised, fun, and full of like minded people of every age between cradle and grave. Yet, for all the Vans there, there was not a single one just like the Blue Bus! How come? Twenty million were made, and BB is standard! The broke Blue Bus Drivers and passengers were only able to purchase trim clips and curtain hooks, but Blue Bus will be treated to more TLC soon. In return, Blue Bus did the 300 mile round trip without a cough, and provided comfortable dining, luxurious lounge accommodation and supportive, comfortable beds, immune to the wind. So, what next? Anything of course, have Bus, will travel.